The peripatetic life of a newspaper mogul. When Roy Wilson Howard (1883-1964), director of the huge Scripps-Howard publishing company, celebrated his 50th anniversary as a newsman, he was lauded by the Cincinnati Times-Star as “a phenomenon of his generation—a born reporter and a top-flight executive, who has never forgotten that the reporter is the core of any newspaper.” Having risen from cub reporter to publisher on par with William Randolph Hearst and Joseph Pulitzer, he “was the ultimate example of the American success story.” Drawing on extensive family archives, Beard (A Certain Summer, 2013, etc.) offers a richly detailed portrait of the man and his times. Howard was energetic and determined but also arrogant, vain, impatient, and exacting. “You are unduly opinionated and intolerant,” he once admonished himself. “Cultivate a greater respect for the ideas and opinions of others even when these run counter to your own.” Early in his career, as president of United Press, Howard extended its reach worldwide, serving nearly 800 papers, with 48,000 wires daily. His prowess made him an internationally prominent figure within news circles and beyond, and that importance was significantly enhanced by his position in the Scripps-Howard organization. He found easy access to politicians, among them, Herbert Hoover, Franklin Roosevelt, Harry Truman, John F. Kennedy, and Dwight Eisenhower. An indefatigable traveler, Howard was given audiences by world leaders, as well: in 1936, he gained an interview with Hitler, who gave “nothing of the impression of a nut”; shortly afterward, he was in Moscow, shaking hands with Stalin. In 1939, in London, Howard met with Anthony Eden, lunched with Winston Churchill, and stopped at the American Embassy to see Joseph Kennedy. He lunched with Dag Hammarskjöld and was friendly with Francisco Franco and Chiang Kai-shek and his wife. He also had a good eye for staff, hiring top-notch editors and reporters, such as Ernie Pyle, but he never relinquished his need to control his vast corporation. 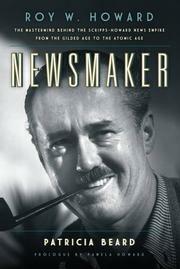 A lively history of one man’s indelible imprint on American news.